I hope everyone had the best of holidays and a Merry Christmas! We have been go go going the past week, which is why I have been missing. I still have a few festive recipes for the next few days, but if you're anything like us...you still have plenty of get together's over the next week. and doesn't everyone celebrate La Befana? ;) And for those reasons...I have more treats.and over the next few days, I will share some of our fun times. Have you guys ever heard of thin mint pizza? if you haven't...my heart is so sad for you!!! Haha. Anyways, a few years ago I overheard some ladies talking about making one for their daughters. I was waiting on someone to join me for lunch and they were being loud and I did what anyone would do...I paid attention. haha I have no idea if I made it "correctly" but have made it a few times and is always a hit, and so I decided to twist it up and do a peppermint version. place dough(make sure it's not cold) on pizza pan, using your fingers to spread the "crust" to the edges. Bake at 350' for about 20-25 minutes. You want it crisp, not soft. But you also don't want it burned, so the cooking time will be according to your oven. Let cool. Let ice cream soften on counter. Place scoopfulls all over the crust and then, using a spatula, spread over the "pizza" Place the cookies over the ice cream. Wrap in foil and let sit in freezer overnight or at least 8 hrs. Such a fun treat and so very tasty! 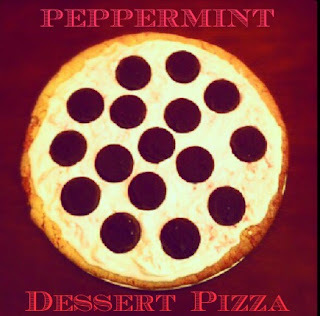 3 comments on "Peppermint Dessert Pizza"